The mission of the Western Tribal Diabetes Project (WTDP) is to empower tribal communities to utilize diabetes data at the local level to track the Indian Health Service Standards of Care for Patients with Type 2 Diabetes, insure patients receive timely care, improve case management, identify gaps in care, and better address program planning. The Western Tribal Diabetes Project serves the 43 federally recognized tribes in Idaho, Oregon, and Washington. The WTDP National component serves diabetes programs outside of the Portland Area. Building a foundation to provide complete and accurate information about the care of patients with diabetes. Using an electronic diabetes register to make informed decisions about clinical diabetes care. Reducing diabetes-related complications and preventing diabetes. Prevent diabetes in high-risk individuals. 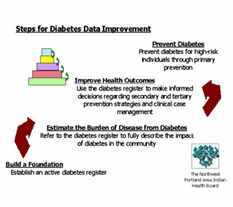 WTDP has developed several tools to guide diabetes programs through a step-by-step approach for data improvement and health promotion. To learn more about WTDP, including our step-by-step approach and tools, please visit our Project Information Page. In 2002, 15.3% of all adult American Indian and Alaska Native (AI/AN) IHS users had diabetes, more than twice the level in U.S. adults overall (7.3%). These prevalence figures represented a dramatic increase, both for AI/AN IHS users – where the prevalence of diabetes was 11.5% in 1994 – and for the US general population – where the prevalence of diabetes was 4.8% in 1994.4 The number of AI/ANs younger than 35 who were diagnosed by the IHS more than doubled between 1994 and 2004, from 6,001 patients to 12,313. Overall, the prevalence of diagnosed diabetes among AI/ANs under 35 was about 1.7% in 2004. Increases in the level of diagnosed diabetes may be partly due to enhanced screening through the Special Diabetes Program for Indians (SDPI), implemented in 1997. While the level of diagnosed diabetes has been on the rise, intermediate outcomes have improved for IHS diabetes patients since the start of the SDPI. Recent analysis of the Annual Diabetes Care and Outcomes Audit showed improvements in mean Hemoglobin A1c, blood pressure, and cholesterol levels. In the Northwest, about 11.2% of adult tribal enrollees said they had been diagnosed with diabetes (not including gestational diabetes) in a 2001 survey. Diabetes increased with age, to almost a third (31.5%) of AI/ANs 60 years and older reporting a diagnosis. More than half of tribal members had been tested for diabetes in the previous five years (57.1%). The Diabetes Management System (DMS) can be a rich source of information for tribes that use the Resource and Patient Management System (RPMS). Check with the local diabetes program or RPMS site manager to find out if the DMS is in use. 1. National Diabetes Information Clearinghouse (NDIC). Your Guide to Diabetes: Type 1 and Type 2. http://www.diabetes.niddk.nih.gov/dm/pubs/type1and2/index.htm. 2. The Unofficial IHS Diabetes Care & Outcomes Audit Support Site. IHS Standards of Care for Patients with Type 2 Diabetes. http://www.dmaudit.com/socfork.htm. 3. Indian Health Service Division of Diabetes Treatment and Prevention. Clinical Guidelines for Adults with Prediabetes and/or the Metabolic Syndrome. http://www.ihs.gov/MedicalPrograms/Diabetes/index.asp. 4. Diabetes prevalence among American Indians and Alaska Natives and the overall population—United States, 1994-2002. MMWR Morb Mortal Wkly Rep. Aug 1 2003;52(30):702-704. http://www.cdc.gov/mmwr/preview/mmwrhtml/mm5230a3.htm. <35 years–United States, 1994-2004. MMWR Morb Mortal Wkly Rep. Nov 10 2006;55(44):1201-1203. 6. Wilson C, Gilliland S, Cullen T, et al. Diabetes outcomes in the Indian health system during the era of the Special Diabetes Program for Indians and the Government Performance and Results Act. Am J Public Health. Sep 2005;95(9):1518-1522. 7. Romero F, Hasty F, Rose R, et al. Northwest Tribal Behavioral Risk Factor Surveillance System (BRFSS) Project, Aggregate Final Report. Portland, OR: Northwest Portland Area Indian Health Board; 2003. Full report available for download from this website under “Resources – Reports”. The WTDP consists of two divisions: Northwest and National. WTDP delivers its services through support from our Portland offices and site visits to participating tribes. During the site visits WTDP staff provide hands-on training and support. Most sites receive at least two site visits. Working with participating tribes, WTDP uses a step-by-step approach for diabetes data improvement. Diabetes (also called diabetes mellitus) is a chronic disease usually characterized by very high levels of blood glucose (often called blood sugar). There are two major types of diabetes, now called type 1 and type 2. Although the two forms are different in many ways, the end result of both is high blood sugar and the long-term complications that result. Over time, diabetes can damage nearly every tissue in the body and result in disastrous complications, including heart attacks, stroke, blindness, kidney failure, and amputations of toes, feet, or legs. Because of the risk of these complications, patients who have diabetes should have regular check-ups. The IHS Standards of Care for Patients with Type 2 Diabetes describe recommended checks in detail. Prediabetes is a related condition in which blood sugar levels are high, but not as high as in diabetes. In 2006, the IHS released standards of care for prediabetes, including screening guidelines. Another related condition, gestational diabetes, sometimes develops in women during pregnancy. Although gestational diabetes usually goes away after the baby is born, a woman who has had it has a higher chance of developing type 2 diabetes later in life. With modest weight loss and regular physical activity, people can delay or prevent the onset of diabetes. This step involves establishing an active, accurate diabetes register. Activities in this step include developing a work plan, conducting medical chart reviews, and establishing a diabetes team. During this step the diabetes register is used to fully describe the impact of diabetes in the community. Activities include estimating the prevalence of diabetes, performing and reviewing the IHS Diabetes Audit, and estimating the incidence of complications. This step involves using the diabetes register to make informed decisions regarding prevention strategies and clinical case management. Activities including working to prevent complications in existing patients living with diabetes, improving clinical case management, and shaping program planning. At this step the goal is to prevent diabetes for high-risk individuals through primary prevention. This step initiates a new cycle of steps: building a foundation for prevention, estimating the burden risk for diabetes, and improving health outcomes.